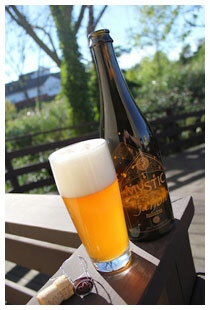 CHELSEA, MA – This week, Mystic Brewery releases Mystic Saison. This is the first beer in the Mystic 16┬░ Series of beers brewed using artisanal Belgian brewing methods in combination with an innovative New England approach to beer-making. Warning: the following is geekified. There is no marketing company involved trying to make it palatable to your grandfather. In fact, Mystic Founder Bryan’s grandfather, upon trying Mystic Saison, insisted that the best beer in the world comes from Boston… already. Mystic Brewery is entirely driven by a fermentation researcher, pro-brewer, and award winning homebrewers. While we like our grandfathers, we are more interested in what our great, great, great, great, great grandfather would think of our beer. Each beer in the Mystic 16┬░ Series is brewed from a wort of 16┬░ Plato. The wort for Batch 1 of Mystic Saison was mashed and boiled in Canton, MA using the distinctive Crisp Euro-Pils Malt as a base along with wheat, oats, and Munich malt. It was entirely hopped using Hallertauer Mittelfr├╝h varieties, with massive amounts of hops at flame out, giving the beer the floral note of classic saisons. The unfermented wort was sent to custom made square fermenters and driven in the Mystic One truck back to Mystic Brewery, a fermentorium on Admiral’s Hill in Chelsea, Massachusetts. There, the fermenters were pitched with Renaud, Mystic’s saison yeast, which is propagated at the fermentorium. The beer was fermented at 90┬░ F in accordance with the traditional wine-making approach used for the most interesting saisons. The beer was then re-fermented in corked and caged champagne bottles for four weeks in a conditioning cave. (Well, actually, it was conditioned in a customized warm tent, but such is the way of retro-innovation.) Exercising restraint, patience and true slow-food inspired principals, the beer was periodically evaluated for release. Having sufficiently conditioned and having been evaluated by a tasting panel, Mystic Saison Batch 1 has been given the nod of approval for release. Slight changes in batches, including the work-making location, formulation, and techniques used, may be made in subsequent batches in order to explore the best way of making the beer. Information on each batch can be found at mystic-brewery.com. Mystic Saison will be available (in bottles only) by Friday, Sept. 9, 2011 at select bottleshops and restaurants. An availability list can be found on the Mystic website, in the “Locations” tab.